I’m going to start off this review by saying I don’t normally read books where I don’t like one of the main characters. I might start such a book, but after about chapter three, if I’ve failed to make a connection with someone in the book, I’m done and move on. 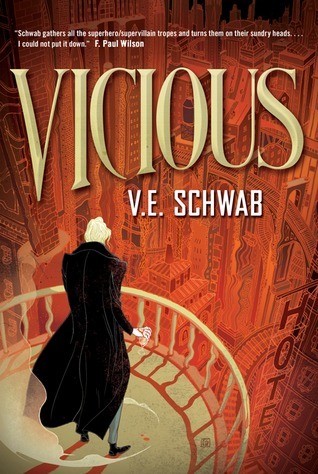 So I was wary when I picked up “Vicious,” by V.E. Schwab. I had heard that the story was about the conflict between two supervillains, and while Loki from the Avengers is a supervillain, and I like him just fine, most supervillains are more…icky, if you know what I mean. So “Vicious” had to grab me at the beginning, or I was tossing it aside. Well, it grabbed me, and I enjoyed the whole thing, right to the very last page. In “Vicious,” we meet Victor and Eli, college roommates who are both brilliant, with twisted sensibilities and the tendency toward boredom. For his master’s thesis, Eli decides to investigate the phenomenon of “extra-ordinary” people. His theory? That people that clinically die and are then revived come back different, with new-found abilities. Victor, eager to avoid boredom, is on board with the investigation. And in very short order, both men “off” themselves so the other can revive him. And lo, both come back with superpowers. Victor quickly finds himself in jail, accused of murdering Eli’s girlfriend. When he gets out, years later, all he can think of tracking down Eli and duking it out. And of course, he gets his chance and sparks and blood fly. Other characters—Sydney, Dol, Mitch, and Serena—get a chance to add to the conflict as well. A combination of “Flatliners” and “The X-Men,” “Vicious” is not without its plot issues. With all the medical technology of today, extra-ordinary folks should be making the papers every day, and of course, in the story, they were not. Still, Eli and Victor were complex characters, and neither could seem to decide if they were friends or enemies. They were adversaries as two chess masters are adversaries—they each wanted to win, but they each respected the moves the other was making. Point, and counterpoint, all through the tale. I really like this book. While I now have to read at least three books that make me feel warm and cozy, I’ll definitely pick up V.E. Schwab’s next offering.